Back with Shaina at Joe’s Pub to celebrate her amazing residency! Come check us out! Had a successful performance and pod cast recording of Trevor Bachman's Farmed : The Orwell Radio at Fresh Ground Pepper's Peppership Party hosted by Kickstarter Headquarters. This beautifully and incredibly talented group brought the piece to life! Join us for a concert reunion where our American Idiot family will come together and sing some Green Day! 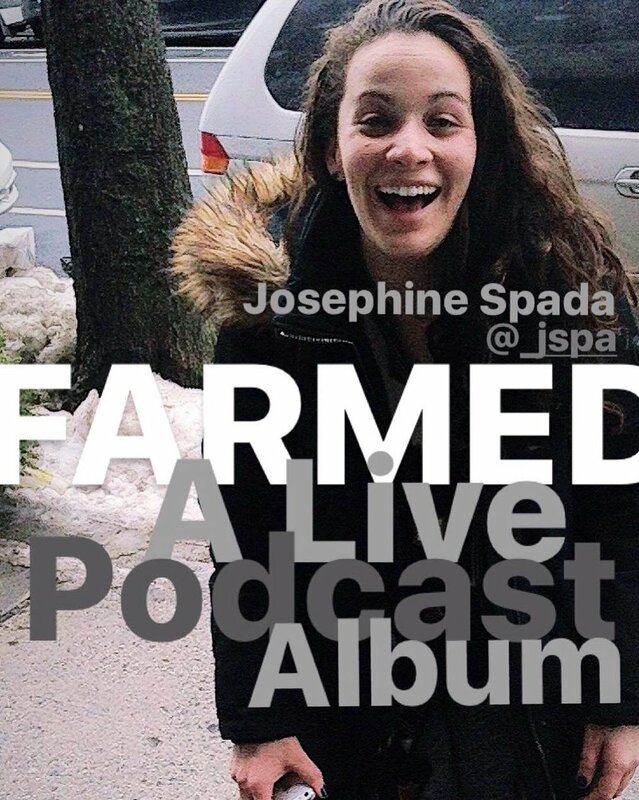 Josephine will be revisiting the role of CLOVER in FARMED : A Live Podcast Album at Fresh Ground Pepper's Annual Gala. Singing with Shaina at her final concert of her Joe's Pub 2017 Residency performance! Check it out! Coming this Fall, Josephine will be performing in All The Lives of Me, conceived by Joe Appel. Stay tuned for ticket information! Josephine is back at it with composer Trevor Bachman for a presentation of his most recent work, Farmed - The Orwell Radio. Stay tuned for audio and video! Josephine performed Better by Trevor Bachman at a concert directed by Annie Tippe benefitting Planned Parenthood. Check out a sneak peak of video from the night. Reading - andrew stein's new play "disrupted"
Directed by Michael Shiralli , June 13 2017. Josephine will be playing the Role of TISH in Naomi Matlov and Teresa Lotz' new musical entitled ThreeTimesFast at Stage 74 this March! performed with Andrew Martin at Josephine's solo performance. Thanks to all who reserved tickets to Josephine's first solo concert on February 8th! If you'd still like to come there will be a waitlist at the door - and if you can't make it, stay tuned for videos from the concert soon to come! Oh, and a big THANK YOU to ACTOR THERAPY for helping to get this show off the ground! Join Josephine as she goes on a musical journey exploring all of the idiosyncratic human puzzle pieces that make her a strong, passionate, silly, and beautifully basic girl from Brooklyn. Come along for a night that will warm your heart and leave you feeling reconnected to each piece that makes your own human puzzle absolutely perfect. Guest Stars will include Jason Gotay, Hannah Kiem, Andrew Martin, and Erin Rice. Josephine will be performing in a New Horror Opera by Trevor Bachman with Barn Fest NYC on January 14th at 7PM. Josephine will be in a reading of a new musical by Vinny Stodder, directed by Ryan Amador at Playwrights Horizons. Happy to be back with Half Moon Theatre Company performing at the Bronx Botanical Gardens on June 4th! Excited to sing in this performance of The Legend of NY! Check us out on the track for this promo video too! Nina in In the Heights! Tickets now available! Also, check us out on playbill! I'll be playing Nina Rosario in In The Heights at Gallery Players this April! Stay tuned for info on Tickets! So excited to be playing Katherine in a workshop of Beautiful Dreamer by Brett Macias and Caroline Murphy with Musical Theatre Factory on Monday March 21 at 9pm! You can get tickets HERE! Singing with the beautiful Kate Ferber at Rough Trade on February 22 at 9:30 PM! An awesome venue and a night packed with incredible people who happen to be just so talented. I'm singing with some other incredible artists on a brand new song by Trevor Bachman and Alex Rubin on December 14th! Performance begins at 8pm! Check out my performance at Le Poisson Rouge for the Booktress Launch Concert! Start video at 1:30! It's almost that time! I'm seeking representation and will be performing in a Showcase with the growing studio on 10/19! If you are in the industry and would like to inquire about attending, contact info@thegrowingstuido.com! 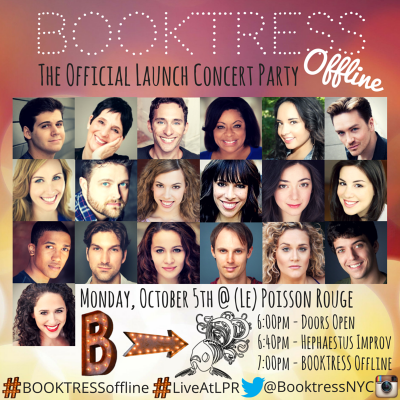 On October 5th, I'll be singing with a slew of enormously talented people as we celebrate the launch of a new company called BOOKTRESS! "Produced by Megan Minutillo and Elyssa Mactas, with musical direction by Luke Williams (ANYTHING GOES NAT’L TOUR), this will be an evening to remember. You'll get to hear behind the scenes stories that are usually kept under wraps, musical theatre and pop/rock songs from some of Broadway’s most successful shows, and get to know what the journey of scoring that dream role is like...or, almost like! Then it's time to party with the performers and celebrate the launch of this innovative exciting company. There will be prizes, medleys, mash-ups, and surprises at this jam-packed evening in one of the best concert/party venues in New York City!" I'm ecstatic to have the opportunity to perform in a production of RENT right here in town! I'm in the ensemble - so I'm a Bohemian, a homeless woman, a junkie, Mark's Mom, among other characters! I'm also understudying Maureen AND Joanne.. oh, and I'm the dance captain! It's been a fun experience so far. Please join us if you can! Harbor Lights Theatre Company is located in Staten Island - a beautiful 25 minute ferry ride away! The show is running September 18th - October 4th. I'll be performing with the wonderful Half Moon Theatre Company at a Gala honoring the Westchester Medical Center on June 6th! Excited to collaborate with such a beautiful group of people. I'm excited to join the beautiful Kate at Rockwood Music Hall Stage 2 on April 26 at 8pm! 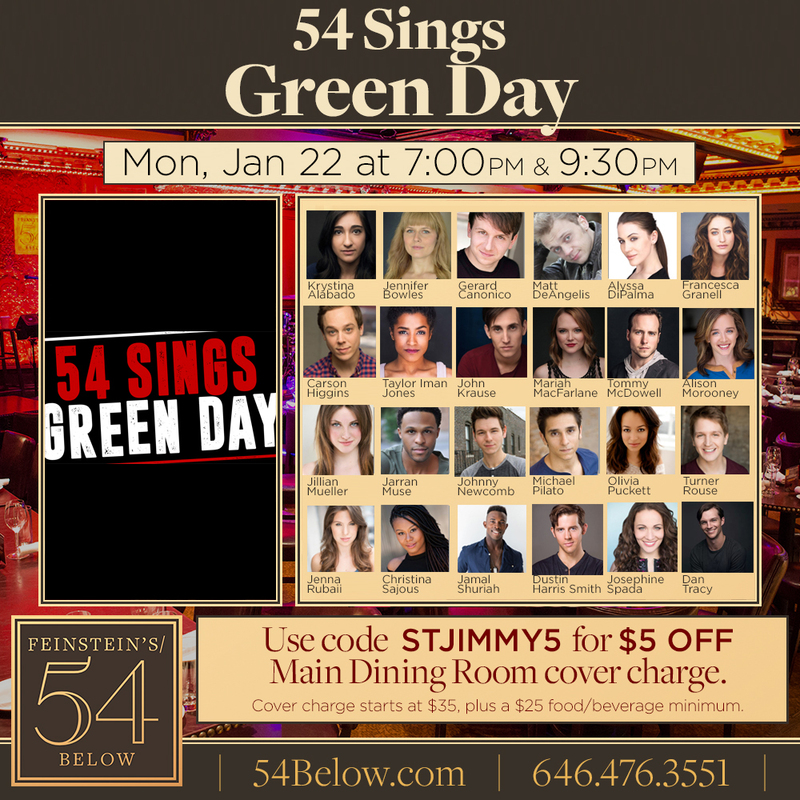 So stoked to be performing at 54 Below with some incredible artists on March 5th. If you haven't heard about ACTORTHERAPY, It's Ryan Scott Oliver and Lindsay Mendez' Class, and It's awesome! Come see us perform at 11pm! I'll be singing at a concert performance of "Elise" a new musical by Jamen Nanthakumar and Liana Wright-Mark at Don't Tell Mama on February 28th! Just went to my first rehearsal with Jasper Grant's community choir. It's nice to be surrounded by wonderful people singing in harmony. Happy to be using those sight singing skills again! Joined Actors Equity Today, January 6th, and it feels Oh So Good!! What a way to kick off the year! Glad to be working with Kurt Crowley again on some awesome vocal arrangements of Salzman and Cunningham's new work this December! I'll be working with Jordan Wolfe and Patrick Kelly on demos for their hysterical new musical this month! I'm happy to start a new class at The Growing Studio, prepping, working, and showcasing work for Resident Directors of Wicked, Side Show, and If/Then! We start in November! Taking an intro to Viewpoints and Labon with Jen Waldman Studio this October! Starting up a new session of Studio Workshop with Jen Waldman this September! Getting my traditional MT heels back on! Now that I'm back in the City - It's time to go back to the basics! I figured I'd try out Meisner Technique at the Acting Studio! And with a heavy heart, I say goodbye to this beautiful monster of a show. I will miss it. The Rage. The Love. The Catharsis. The Movement. The Cast. The Traveling. The Music. The Company. The Bus Rides. The Story. The Life. This has been a truly incredible experience and I will never forget a moment of it.